A couple weeks ago I was looking at different 3D slots online. I have played so many (I never really kept count), but after awhile I need to mess around with something new. That’s when I found 2 Million BC. It’s a prehistoric game built around a caveman named; Oogh. Oogh fears nothing, and when his wife discovers a pile of diamonds, Oogh become hell bent on getting them for her. In order to succeed, Oogh must go through countless trials and tribulations, which could mean his life. It will be up to you to help this caveman reach his destination and make his loving wife happy. 2 Million BC is a 5-reel, 30 line game with a host of bonuses and features (I’ll get to those in a minute). If you plan on playing for awhile, the game has an AutoPlay feature where you can choose how many spins to play, and you never have to click the spin button. I could list all the button descriptions for you, but quite frankly that’s a little boring. Everything from various denominations and rules are available, but this is all something you can look at on your own time. Instead, let’s talk about something fun. If you want to play the Saber Attack Feature, you have to collect 3 acorn tokens. The only way to do this is to spin the reels and hope an acorn lands on the 5th reel. Once you do this three times, the feature will be activated. When taken to the feature, you control Oogh’s ability to take down the Sabertooth Cat. Oh, and the quicker you can knock out the Sabertooth, the bigger the reward. Stealing the diamonds from Sabertooth Cat isn’t going to be easy. First you must hit three Diamond symbols on a payline. The first time I played this I saw 3 diamond symbols come up 4 times, but none of them were on a winning line. It wasn’t until the 5th batch that I hit the bonus. However, the payout was great. Over $200 won, even though it took 244 spins to hit it. How will you steal the diamonds? Will you attack the Sabertooth? Will you try to sneak by him? Whatever the case may be, you want to get it right on the very first try. You have a 33% chance to get it right. Just about all online slots have free spin bonuses. 2 Million BC is no different, and once three of the camp fire symbols land on the board; you hit the bonus. If you like bonuses that can keep on going, this is the perfect one for you. The first time I hit the free bonus, I noticed that every time another camp fire symbol came up, I received another bonus spin. When it was all said and done I got 22 free spins and $84 and some change in winnings. 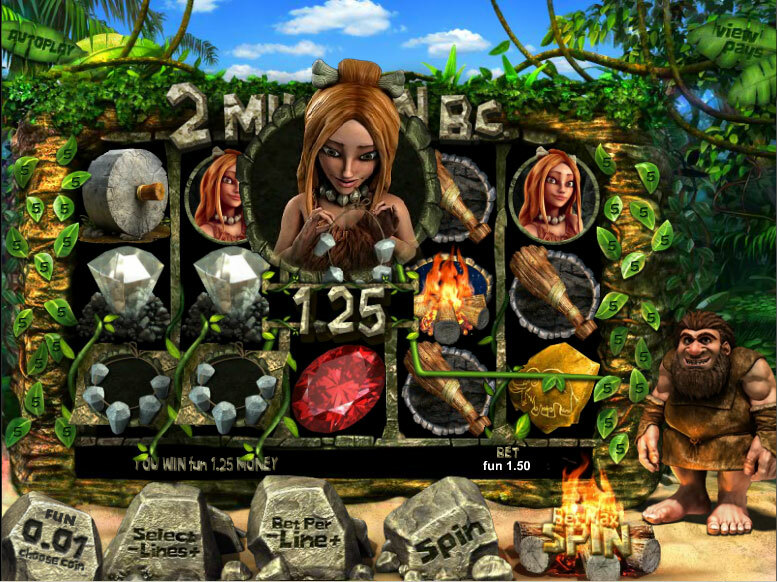 So, if you’re ready to team up with Oogh, the 2 Million BC 3D slot will be waiting for you.